The challenge is to get the balance right between simply telling and actually showing. 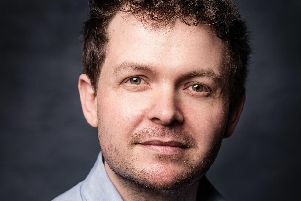 Adapter and director Nick Lane hopes he has done exactly that with his new stage version of The Sign of Four. Blackeyed Theatre are touring Sir Arthur Conan Doyle’s epic second Sherlock Holmes novel to venues including Portsmouth’s New Theatre Royal (November 15-17, tickets on 023 9264 9000). “With crime fiction inevitably, you get a lot of reported action,” as Nick says. “Sometimes you see crime fiction on stage and you are being told what has happened and you are then getting a big series of questions about whatever it is that has already happened – rather than dramatising the actual action. The company is considerably helped by the fact that the audience are on board to start with. Every generation gets its own Sherlock Holmes. He is a character with an enduring place in this country’s heart. But Nick is happy to break new ground – to an extent. In the play, when Mary Morstan arrives at Baker Street to request help following the mysterious disappearance of her father, Sherlock Holmes and his companion Dr Watson are plunged into a murky world of deception and a complex plot involving murder, corruption and stolen jewels. Nick’s starting point is that he simply loves all crime fiction: “And with this, you have got the complete archetype, Holmes and Watson, the double act, that fantastic partnership. You see it in Morse and Lewis. You even see it in Cagney and Lacey. The cast features Luke Barton as Sherlock Holmes (The Unexpected Guest, Mill at Sonning; Misterman, Liverpool Everyman and Playhouse), Joseph Derrington as Dr John Watson (The Importance of Being Earnest, MAC Belfast; The Canterville Ghost, Erasmus Theatre), Zach Lee as Jonathan Small (Bouncers, Glass Menagerie, Hull Truck; The Derby McQueen Affair, York Theatre Royal), Stephanie Rutherford as Mary Morstan (Kubla Khan, Mirror Mirror, Oily Cart; Cinderella, Derby Theatre), Christopher Glover as Dost Akbar (Peckham The Soap Opera, Royal Court; Eastenders, BBC) and Ru Hamilton as Thaddeus Sholto (Tipping the Velvet, Lyric Hammersmith; Peter Pan, Derby Theatre).